Located just a couple blocks from the Atlantic Ocean in North Myrtle Beach is The Surf Golf and Beach Club. This golf course is the only “private” club in the North Myrtle Beach area. 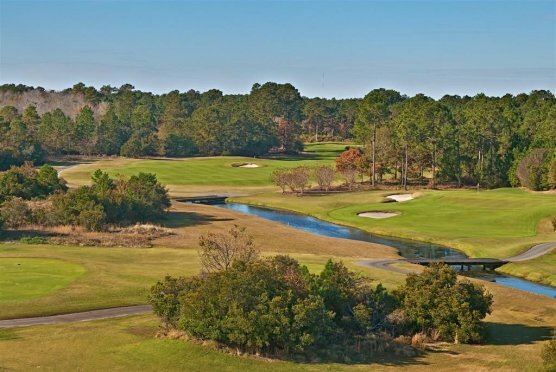 Luckily, you don’t have to be a member to play as they accept a small amount of package play, and Myrtle Beach Golf Authority is one of the package providers that can book tee times at this beautiful, well-manicured golf course. When you add the Surf Golf and Beach Club to your Myrtle Beach golf package, you can rest assured that you will be playing a 18 hole golf course that is always in impeccable shape. Even though it’s only a few blocks from the beach, there are no ocean or marsh views on the course – don’t let that disappoint you though, the course has plenty of beautiful and natural scenery for you to indulge in. You will see plenty of water on the course, just not from the ocean or marsh……. Surf Golf and Beach Club was designed back in 1960 by George Cobb and updated in 1992 by John LaFoy. The Par-72 course plays just over 6800 yards – enjoyable for golfers of all length and skill level. The Surf Golf and Beach Club is the third oldest course in the Myrtle Beach area with only Pine Lakes and Dunes Club being in the area before Surf Club. In 2016, the course was closed for a couple months while all the greens were re-done. They took out the bent grass and put in Champion UltraDwarf. They also added drainage to the front of the greens to allow for run up shots. The bunker sand was replaced shortly before the greens were replaced. The fairways are in great shape, even after Hurricane Matthew, which spawned a tornado that whipped out over 100 trees along the 18 holes and restructured the 1st hole completely. Not only did Surf Golf and Beach Club get new greens, but they also invested over a million dollars into a new pro shop, locker rooms, grill and building a new indoor-outdoor bar area. This Myrtle Beach golf course is still old school though, even with the new greens. You have big oak trees that make the player use different skills to shape the shot to land on the greens – but landing on the green doesn’t necessarily mean a birdie or even a par – the greens are slippery and a lot of the putts will be downhill leading to the possibility of a lengthy putt back up the hill. Three putts are not out of the question, even with a good approach shot to the green. The water hazards on Surf Golf and Beach Club come into play on 3 of the par-3’s with the final hole being a huge 217 yard tee shot over a pond. Test your skills on the par 5 10th hole that will allow for long hitters to knock their tee shot over the two ponds and attempt to go for the green in two. Those players who don’t hit the ball a ton will have to deal with a tee shot followed by their approach with a 3-wood or hybrid with water on the left and trees on the right.